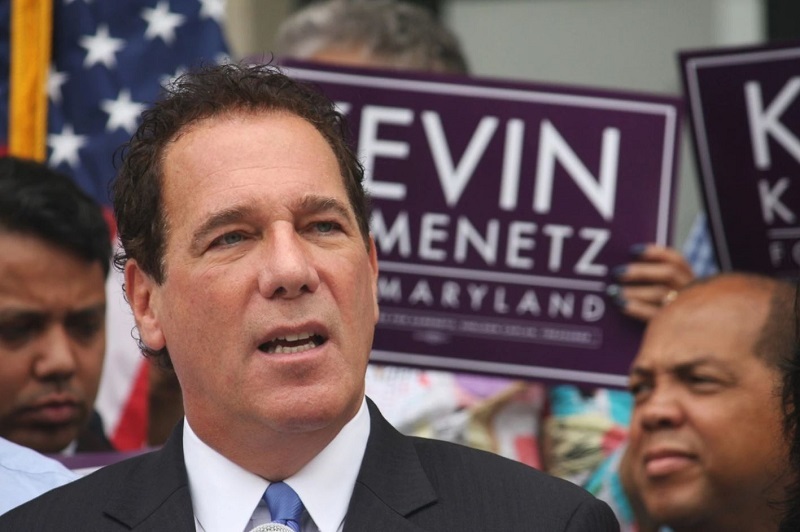 Rather than print new ballots before next month’s primary, Maryland elections officials decided Thursday to notify Democratic voters that former candidate Kevin Kamenetz has died and that a vote for him will be counted as vote for Valerie Ervin, his former running mate.. The elections board on Thursday distributed two pages of instructions to local elections authorities telling them to distribute a notice to voters describing how they can vote for Ervin and her running mate, Marisol Johnson. The notice will be placed in every voting booth, published online and shared on social media. “That’s not going to cut it,” Ervin said of the signage. The state Board of Elections has said that it could not print new ballots to reflect Ervin’s last-minute gubernatorial candidacy largely because a single paper mill makes the only paper that Maryland’s voting machines can read. Officials say they checked with the mill in upstate New York and it won’t have any more of the special paper available until the fourth week of June — that is, election week. Election officials had proposed the notification solution earlier this week to the Democratic candidates in the June 26 election, but were met with concerns about sowing confusion and of giving Ervin’s campaign additional attention. Ervin said she is not satisfied with the state’s plan and is exploring a potential legal challenge. “They never got sign-off from us,” the Montgomery County Democrat said. Any notifications posted in polling places will only further confuse voters, she said. “It will impact the results of the election, whoever wins,” Ervin said. Nikki Charlson, Maryland’s deputy elections administrator, said adding a new candidate’s name to ballots after they’ve already been printed is not a simple task. Sure, Charlson said, anyone can photocopy a $20 bill but that doesn’t mean it’s legal money. It’s the same for ballot paper. Charlson said Maryland’s voting system relies on carefully calibrated printing to ensure there are no errors when the hand-marked, paper ballots are counted by machines. “There are very strict tolerances for ballot printing because you can’t afford to have mistakes,” Charlson said. Then there’s the paper, which is manufactured by Memphis-based International Paper. The state ordered paper for 1.5 million ballots months ago from the company’s Ticonderoga, N.Y., paper mill. “It’s not even paper you can just buy on the market,” Charlson said. In December 2014, the Maryland Board of Public Works awarded a $28 million contract to Election Systems and Software to build the state’s new voting system. The company’s system requires the use of a unique paper it developed to work with its counting machines. It calls the paper “CountRight.”The company says the paper is specially calibrated to have the right thickness, opacity, brightness, smoothness and weight to be read by its machines. A spokesman for International Paper declined to comment. The gubernatorial primary is the most complicated election the state runs. Charlson said preparing the ballot involves two dozen databases to produce 747 different ballots to represent each possible combination of offices and party affiliation at any given voter’s address. She said officials might be able to work quickly to produce the electronic files that are used to print the ballots and then have them hand-proofed by each local board of elections. That normally takes about two weeks. But even if they could get the paper, they’re worried about making mistakes or producing ballots that don’t get properly counted. “The opportunity for error is huge,” Charlson said. Charlson said elections officials are focusing their efforts on educating voters. The state board will aim to get the message about Kamenetz’s death and Ervin’s replacemennt to every single voter. “They never got sign-off from us,” the Montgomery County Democrat said.Any notifications posted in polling places will only further confuse voters, she said. [She]said the paper-mill issue was a paper-thin excuse. Ervin decided to run after Kamenetz died suddenly May 10. The former Montgomery County Councilwoman said she’s had conversations with attorneys “who believe we have solid grounds to stand on” to get her name on the ballot. Ervin did not say what type of legal challenge she may mount but indicated that it might not be resolved until after the primary. Still, she said such a challenge would be important to pursue to help resolve future problems associated with having to make last-minute changes to ballots. Be the first to comment on "Candidate’s Sudden Death Creates Ballot Challenges, Controversy in MD Governor’s Race"